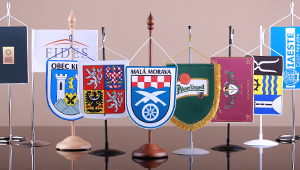 We’ll manufacture table flags fitting your individual requirements. Just tell us your idea and we’ll prepare a graphic design and then proceed with the manufacture. We can recommend the size, attachment and rendition, creating a classic or more exclusive appearance of your table flags. The choice is yours! We’ll take care of everything you need, including desktop stands and other accessories.